Today in the Clear Spring School wood shop my 5th and 6th grade students will begin working on blue bird houses. 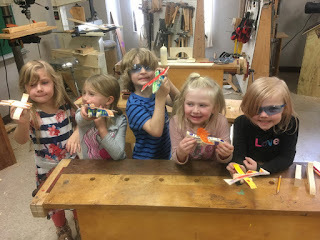 My Kindergarten students will make toy airplanes. One thing I learned growing up as a son of a combat veteran is that the costs of war are often unseen, and that they linger. Young men and young women rise to defend our country and must do so because of the greed, arrogance, and short-sightedness of world leaders. To work toward the creation of useful beauty is good for what ails us. 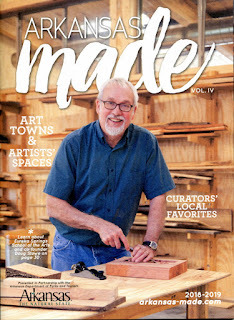 Former President Jimmy Carter is a woodworker, and it shows in his post presidency years. On the world stage, he continues to direct his hands toward world peace. On the local and national level, he's worked to solve problems of poverty and homelessness. There's something that happens in the soul when one works to craft and create. The photo is in our ESSA blacksmithing studio and shows vets shaping useful objects from iron under the watchful eye of our master blacksmith and board member Bert Jones.. I am gathering items to send to my publisher to plan their cover shot for the Wisdom of the Hands Guide to Woodworking with Kids. I have a large number of things for the photographer to choose from. The image shows the process of cutting small wheels using the bandsaw. 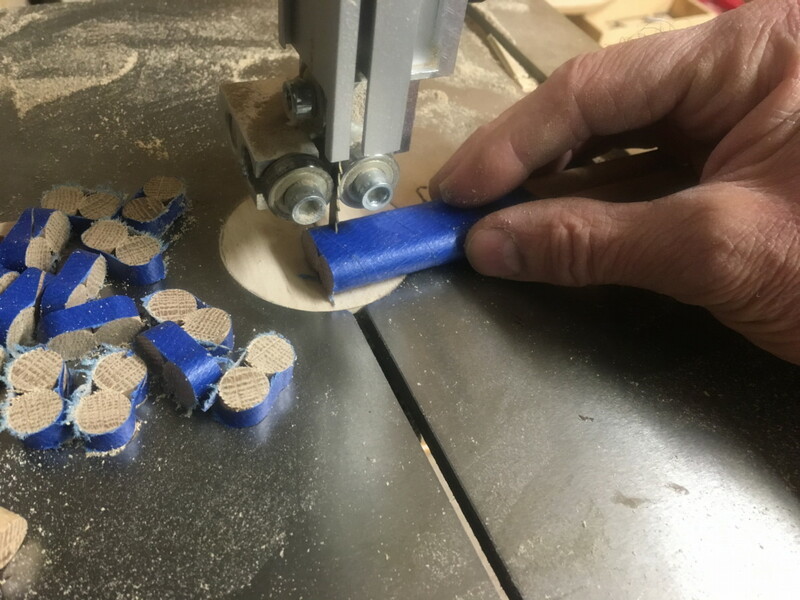 Normally, cutting something round can be a risk due to round things twisting while being cut. Taping two or more dowels together to cut at the same time eliminates this risk. A friend had asked for a list of authors to help in her investigation of progressive education. Here is my brief response. It may help you as well. Much of the progressive education movement started with Pestalozzi who wrote a best seller in the late 1700’s called "How Gertrude Teaches Her Children." Next in my thinking would be Froebel about whom I wrote in my book "Making Classic Toys that Teach." Next in line are a number of educators, including Diesterweg, Cygnaeus, and Salomon, then John Dewey and William Heard Kilpatrick. The thing to remember is that "progressive" does not refer to the introduction of something new related to "progress" but to the natural development of the child. Children and flowers, given proper nutrients grow in similar "progressive" fashion. 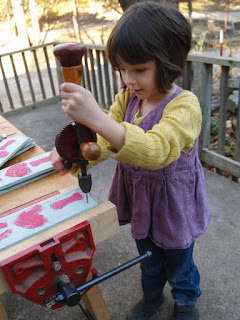 A favorite essay of mine, is "the child as craftsman" by David Henry Feldman. I referred to him last week in my blog. https://wisdomofhands.blogspot.com/search?q=feldman as I have time and again. 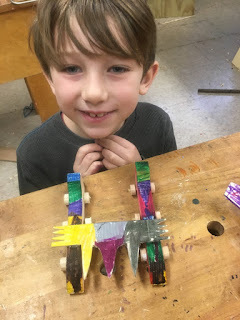 My idea for making tiny wheels came from a desire the kids have had for making airplanes. The large wheels we make ourselves are too big to fit under the wing of a small plane, so tiny wheels seemed to be a next step. 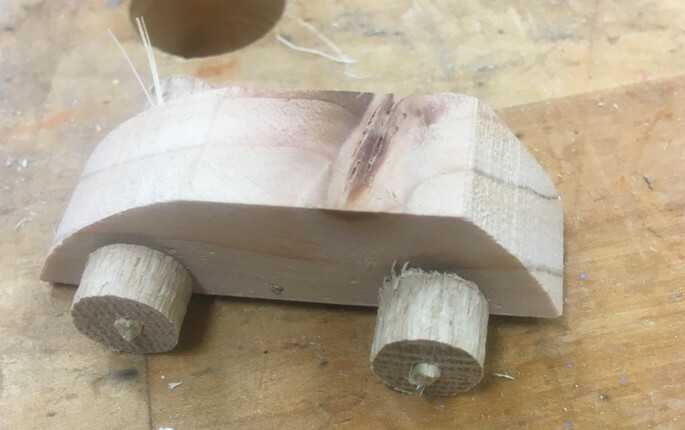 The tiny wheels allow the making of tiny cars and trucks that fit the pocket. 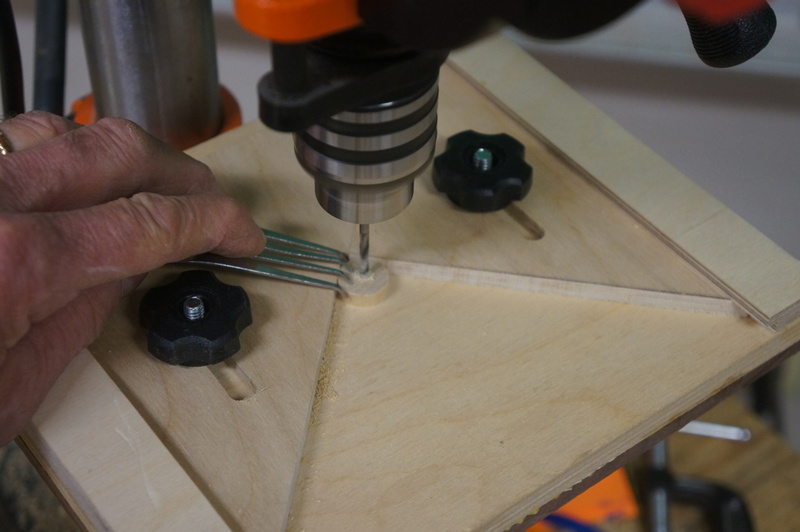 The image shows the device we use with the drill press to hold the wheels centered under the drill bit. You can see in the photo how small these wheels can be. A 1/8 in. drill forms a perfect hole to fit a bamboo skewer as axle. 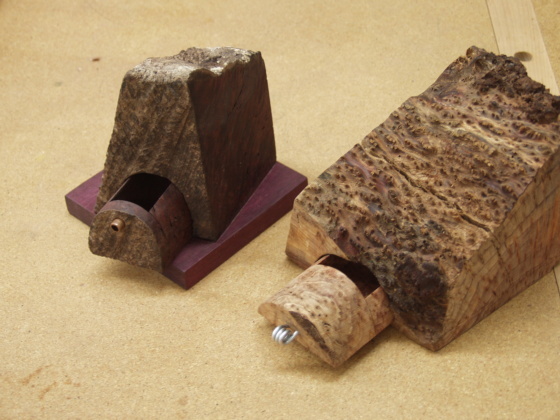 The pen drilling vise applies pressure on the outside of the wheel blank that keeps it from splitting. The students were pleased with the toy cars carried off in their pockets. Yesterday was "cyber-Monday" in the US and shoppers in the US are busy buying stuff online and in stores. What you buy new this year will be trash in barely a few more. The excitement of stuff quickly wears off as it wears and as shiny new replacement stuff is acquired. Let's turn our attention toward making things instead of owning them. 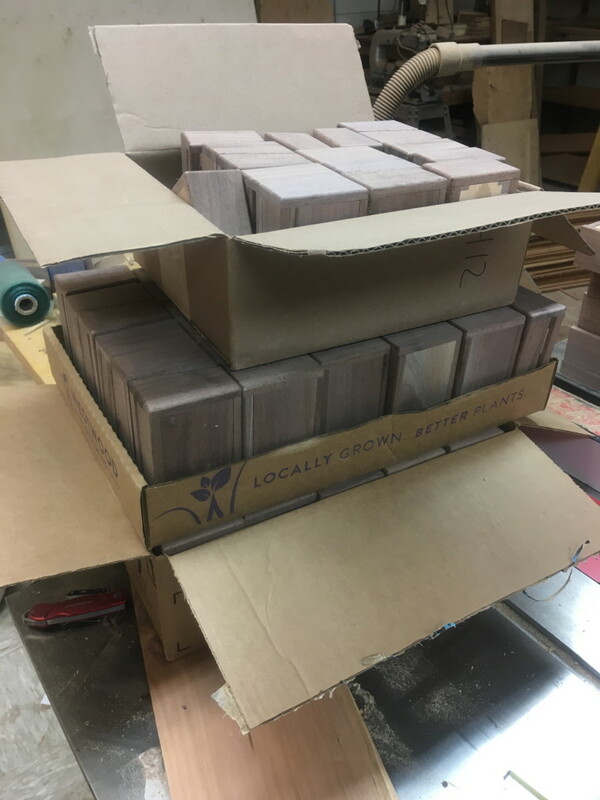 We would be transformed by the process and if we are making things from wood, the wast can be composted and return to the forests from which our lumber comes. We have 28 Making days left before the Christmas holiday. My students and I have been trying our hands at making tiny wheels. We first make hardwood dowels, then cut them to length on the bandsaw, and then drill holes at the center of each one. 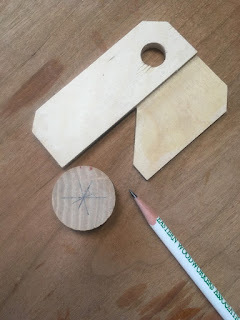 My first grade boys were able to drill their own using a centering clamp intended for drilling stock for making turned pens. The axles are bamboo skewers. 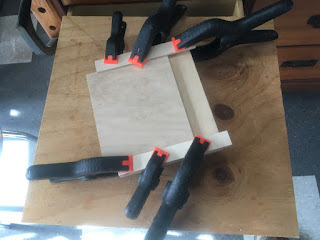 These are much cheaper than buying hardwood dowels and can be trimmed to length using wire cutters. 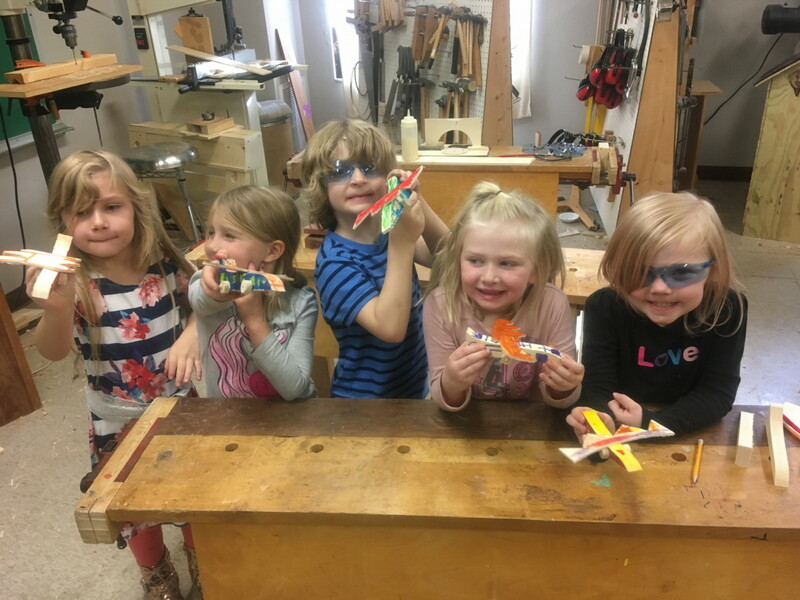 If anyone was ever to face a crisis in which they might feel unwanted, or without purpose, they might consider spending some time in a class full of kids, each wanting help with something that they want to make. There is a particular appeal to the making of tiny things. When children do real things in school, they are invited to observe. Observation is the foundation of science. When they are invited to question and form hypotheses, they are thereby invited to think. Education has always had two conflicting missions. One was to establish societal order and control. The other was to raise the level of intellectual engagement in society at large and for individual students, that they might rise to highest capacity. A body of students intellectually engaged, and encouraged to question the established order may not be what some schools really want. There are too many risks involved. Finnish brain researcher Matti Bergström suggested that children are presented two games. One is the white game in which they are expected to do what parents and teachers want. The other is the black game in which children do what they want and learn from it and the consequences. 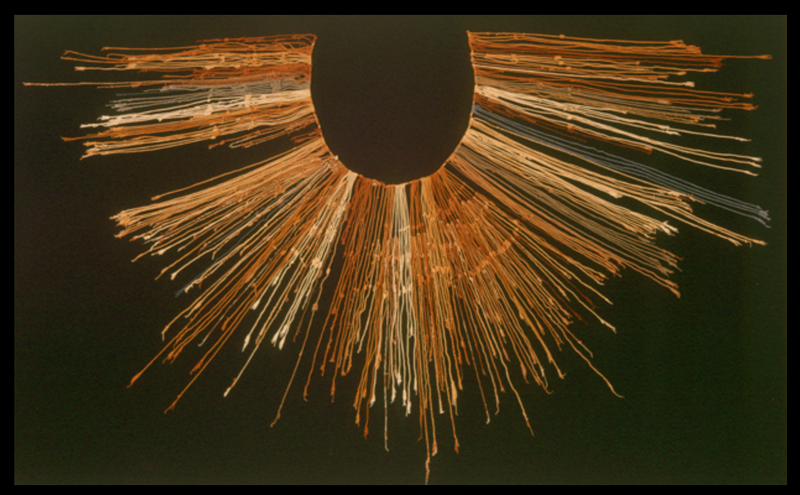 Bergström insists upon the importance of the black game, asserting that human culture must arise anew within each generation. That black game is most apparent when children play. At North Arkansas Regional Airport on Wednesday I noticed (observed) that almost without a single exception, cars were parked within the lines. Where lines are provided people apparently choose order over chaos and work with others in a cooperative manner that provides ease and certainty to all even without the heavy hand of the state. We had a lovely Thanksgiving day with family and friends. The food was incredible, and I salute those who dedicated their hand skills and intelligence to prepare it. believing whatever we are told or whatever we want. When you gather young men and women into schools sequestered from reality, what you may get is folks who grow up either believing what they are told or believing it's sufficient to believe whatever they want. Stupid and sad whichever the direction. In the meantime, some doctors are beginning to prescribe "park time" as means of alleviating the effects of depression and anxiety. They are writing actual prescriptions on paper and recording them in patient records just as they would if they were prescribing drugs. We've noticed what a joy it is to spend time with our Goldendoodle Rosie in our side yard. Early morning or late at night with flashlight in hand, and observing the real world that surrounds us. I've learned that some of my best thinking and reflecting time is when I'm walking behind the push lawn mower. At Clear Spring School after having had just a bit of snow, the woods are now relatively safe from ticks and the kids are allowed to build forts. There is no nature deficit disorder at our school. And if you would care to witness joy in service of learning, you would be in the right place. When it comes to believing what ever you want, or what you've been told over and over again, I'll ask you to examine your own life. When were the points at which you learned something that turned your life around? Can we use those points to reconsider American education? Were you doing something real? And if that may have been the case, can we use what you know to redesign American education so that kids are trusted to do real things? Let's take time to be thankful that we have heads and hands and that if we put both to use at the same time, we will have the power to bring change even to an institution as large and out of touch as is American education. A few years back I was working in the Clear Spring School wood shop getting ready for classes that would follow summer break. A family with three kids drove by and seeing the school sign, decided to stop. They seemed impressed until the mother asked, "What are your test scores?" I attempted to explain that test scores were only a very small measure of student success and that we were not reliant on standardized testing to measure student performance. I could see in her face that she would not become the proud parent of students at the Clear Spring School. What a long and ugly way we've come. As a student in Omaha Nebraska public schools in the 1960's we took the Iowa Basic Skills Test (focused only on the skills of reading, reasoning and math) and we were told to keep the results private. They were not to be shared. The test was not a competition between students or intended to give particular parents bragging rights. The test was intended to give administrators a sense of overall school performance, with the intention of improving education for all. Somehow, the cat got out of the bag. All the crap stuffed inside got loose and standardized testing has become a plague upon mankind, upon schools, upon teachers and upon the individual students whose lives are from thence on based upon a day filling out dots. When we took the Iowa Basic Skills test there were no practice tests. There was no cramming of students minds in preparation for the test. There was no ceremony to the process. We showed up thinking we were to have a normal school day. That's way different from now. And while schools were once concerned with individual children and their success, they've become creatures immersed in stats. The saddest part is that so many parents have also succumbed to the disease. Wood shop, and the opportunity for students to do real things in school, that do not require standardized tests to measure, are ways to restore schooling. You do not need a standardized test to demonstrate that you can play a B flat on a clarinet. 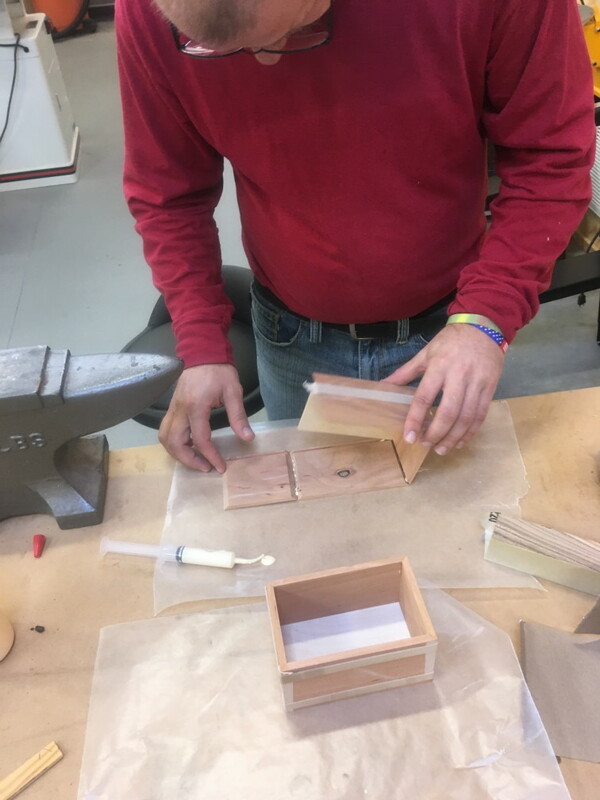 Nor do you need a standardized test to know that the thing you made in wood shop was your best effort or that you learned new things through your own creativity and engagement or that what you take home will be admired. Most folks if asked to identify a particular learning experience that left important marks on their own lives will note the presence of their hands as being instrumental. We call those learning exercises "hands-on," and note (if we are paying attention) the particular effectiveness of hands-on learning. And yet, we allow schooling to be engineered in such a way that the hands are left aside and sequestered from the learning experience. The consequence is that many students are left disinterested, and disengaged, and they often resort to disruptive behavior as a way of alleviating boredom or to assert their own learning needs. If we were to design schools to maximize student learning potentials rather than to warehouse them off the streets and manage their behavior, we would make every learning experience hands-on. The hands engage with physical reality in ways that assert the truth of the experience. They offer greater depth of engagement. In the German language, knowledge is recognized in two forms, Kentniss, which is what one learns from one's own experience, and Wissenshaft, referring to knowledge that is passed along second hand through books or lectures. 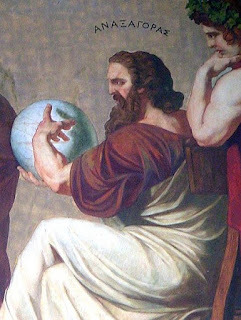 As most folks can tell, second hand knowledge is superficial at best, generally short-lived and yet of enormous value if connected with practical experience and situations to assert its usefulness. Some of each is required, and knowledge of both forms concurrently acquired is best. 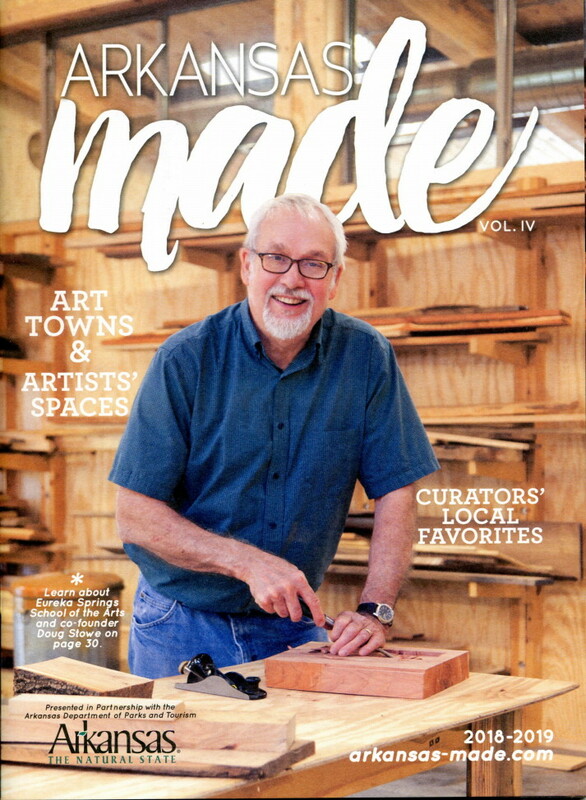 My students and Bevins Skiffs are shown in the current issue of Wooden Boat Magazine (Nov-Dec. 2018) in the launching section that notes new wooden boats being completed and launched. Typically in schools, students rarely ask if they can take their work home. Why bother? 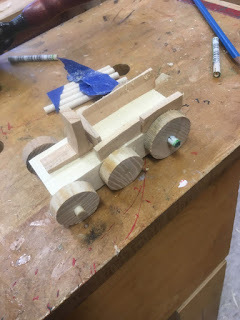 But when it comes to things kids have made in wood shop, they ask, "May I take this home?" Why's that? Could it be that they feel they've arrived at a level of mastery in what they've made? Could it be that they, having tangible evidence of what they've learned, want to share it with their parents and siblings? Can it be that they find joy in what they've made and want to maintain possession of it and what they have learned? 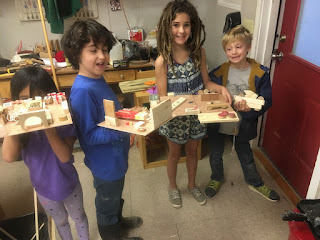 David Henry Feldman, in his essay, "the child as craftsman" was inspired by his study of gifted and talented children to note that ALL children have a desire to express confidence and skill. There is no better way to do so than through the making of real things. 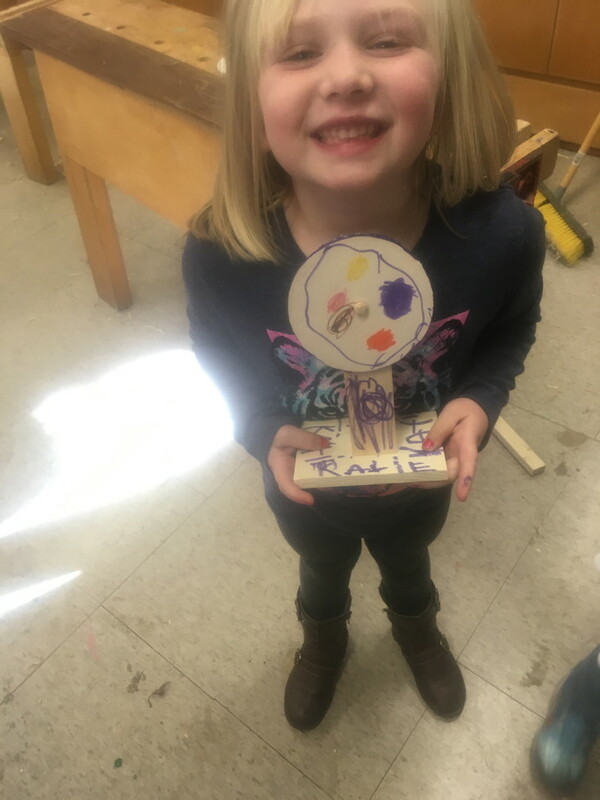 And so, on Friday afternoons when I have Kindergarten students in the Clear Spring School wood shop, they ask, "Can I take this home?" 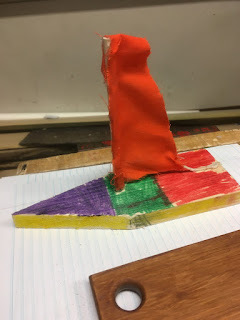 The object can be a simple thing, a toy car, a boat, a flag pole or a color wheel. They may have had some help with the work, as it would be a rare thing to have the skills and knowledge to do the work alone and by themselves. But the pride of craftsmanship is a serious thing that is too often lacking in public education. I hope to reverse that loss, and build upon what's most natural to the child. They each want to acquire demonstrable expertise. They each want to share what they've learned with family. 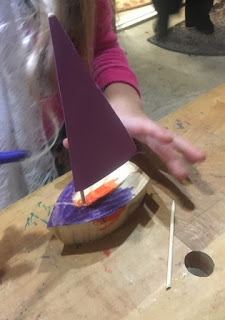 And if the objects are useful in some way, they want to take them home to use and to demonstrate, and to allow others to join them in that play. When Otto Salomon designed the various model series for Educational Sloyd his choice of making beautiful and useful objects was to gain parental support for education during a time in which children's toil was required on the farms. To give up a child to education required that schools earn trust. So making objects that were useful in the home became a means to establish that trust, and to assure parents that their children were becoming not only smart, but useful in school. Where is that concept in modern American education? Join me please in an effort to restore. I am going through some of what I consider to be important stuff on this blog with an eye toward finding those things of particular importance to add as sidebar material in my new book that is now in the process of being edited for publication. This material I think is important, and from a wisdom of the hand blog post, Saturday, August 21, 2010. 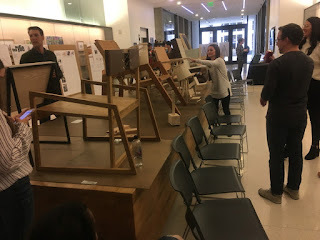 "A few days ago, I posted on the subject of David Henry Feldman's metaphor, The Child as Craftsman, http://wisdomofhands.blogspot.com/2010/08/child-as-craftsman.html and today I want to share Dr. Feldman's exploration of assessment. Our fixation on assessment is what drives our continuing "no child left behind" like testing psychosis, even within the Obama administration. 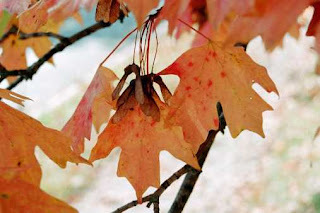 "Testing is a holdover from earlier metaphors discussed in an earlier post, which for the sake of making my writing a bit easier this morning I won't repeat. ""The first is simply a restatement of the educational aim of engagement in a more precise form; to the extent that greater numbers of individuals find fields to pursue, find work that engages their energies and through which they derive satisfaction, education can be considered to be making progress." "Imagine this relative to the level of disengagement we too often see in American classrooms. ""education is done well, creative contributions will tend to take care of themselves. In other words, an education which fosters sustained commitment, satisfaction and joy in accomplishment will naturally lead to occasions that require one to go beyond the limits of one's craft. To reach the limits and find yet another problem to be solved, a goal to be achieved, an idea to be expressed, a technique to be worked out--these are the conditions which favor creativity. 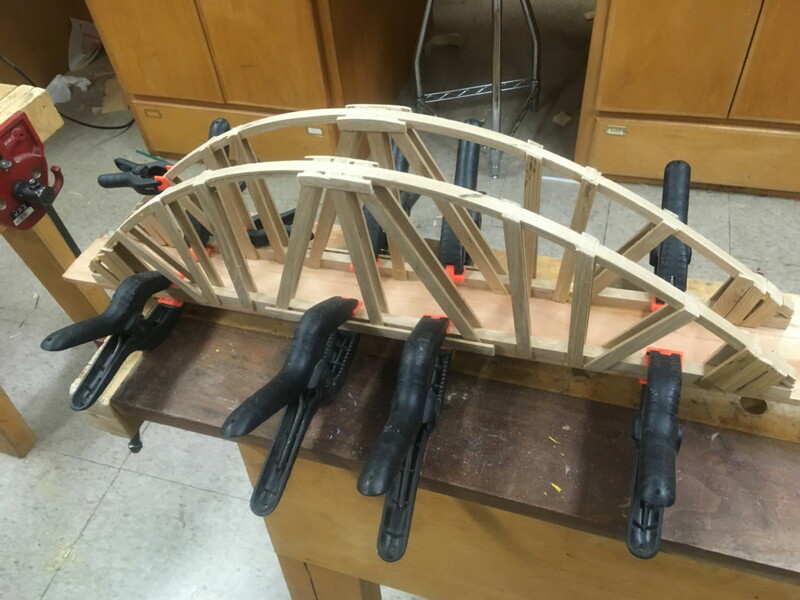 An example of the child as craftsman is my student, who once his bridge had been tested and proven to support over 400 lbs. without distortion, he insisted on adding additional support. 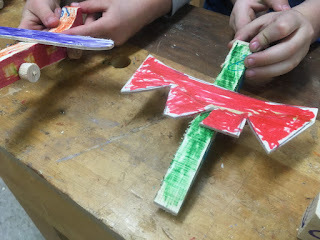 You can also see it in the work by my Kindergarten students making "color wheels" on Friday. 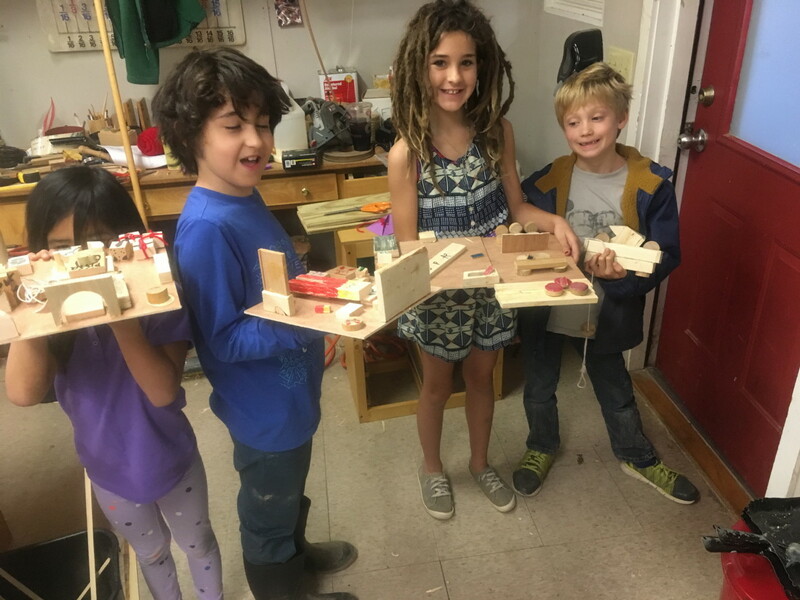 Yesterday in the wood shop at the Clear Spring School, we tested student bridges to see if we could break them by applying weight. The weight was applied by standing on them. The maximum weight was applied by their teacher Chris and me standing on one at the same time. The arched bridge thereby held about 410 lbs. without showing any sign of stress. 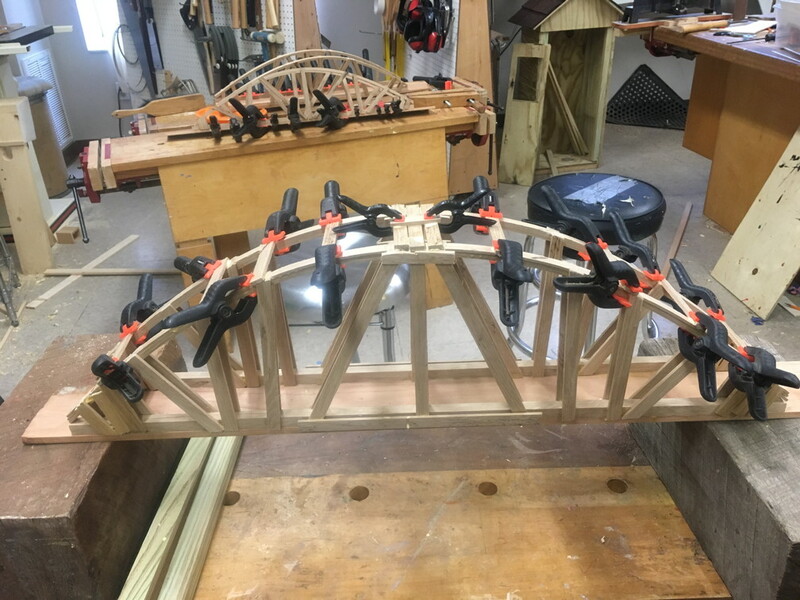 That led the student whose bridge we tested to add more structural support. For what reason? He was extremely proud of his work and unwilling to consider it complete. It was fun at the end of the day, watching bridges be proudly taken home and displayed to their parents. You can be sure they also described the fun they had during the testing of their load bearing strength. Yesterday I had 6 of our Kindergarten students in the wood shop to make "color wheels". A color wheel to an artist is a wheel on paper illustrating the variety of colors and their interrelationships. 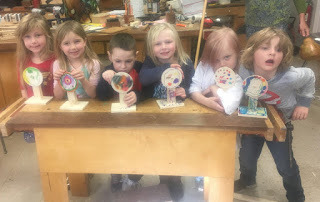 The color wheels we made, and as shown in the photo are discs of wood on stands that the students could color and spin on a wooden axle. As the disc spins, the colors blend and merge and transform, so this project is in perfect alignment with Froebel's gifts. It is also a project I thought about in the middle of the night. I can imagine Froebel doing the same thing. With Kindergarten students, a project does not necessarily need to make sense. They are ready for anything that can be made with nails, wood and glue. Colored markers offer even greater delight. Then if the project offers action of some kind and can be manipulated in some way, so much the better. I heard from my friend Hans in Sweden who's now 85. I had written him to confirm the accuracy of the following as it applies at the Clear Spring School. 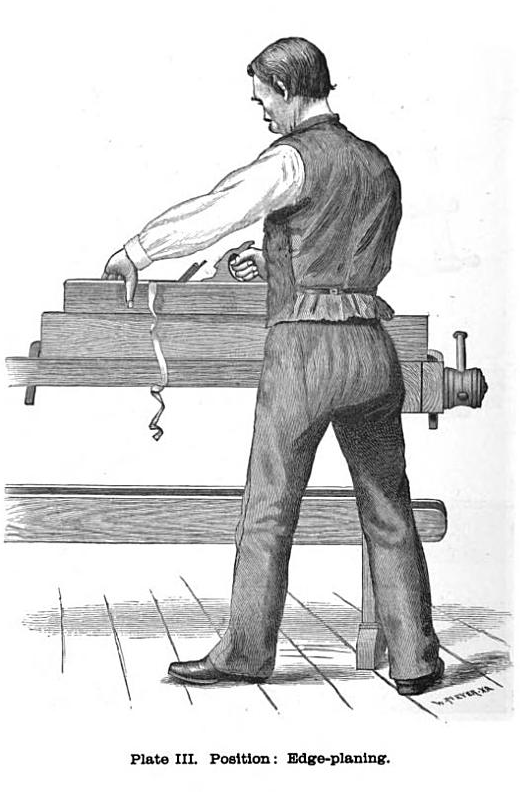 In the early days of educational sloyd, the progression of pedagogy as outlined in its principles "from easy to more difficult, from known to unknown, from simple to complex" was arranged through the gradual introduction of various tools, gradual increase in complexity of procedures with those tools and increasing difficulty and complexity of projects. 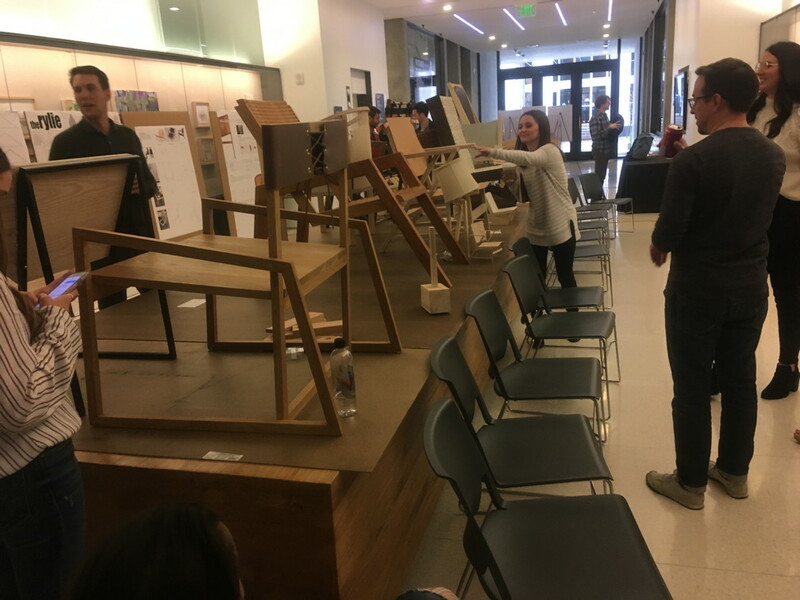 The increasing difficulty of projects shown to the students as models was simply the means through which to introduce increasingly complex and difficult processes in tool use. At the Clear Spring School models of projects for students to make are of great value. What the kids see, they emulate, whether it's something I've made as an example or something another child has made. 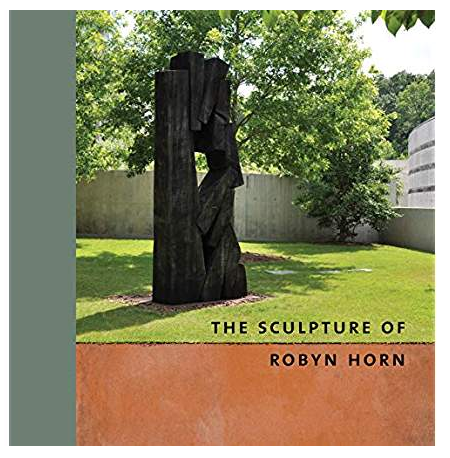 The point is that models turn abstract thought into concrete expression The models became the focal point of attention and the organizing principle in the curriculum that was shared throughout the world including the US. Critics both in Sweden and around the world claimed that adhering to a set of models ignored the child’s need for creative expression. 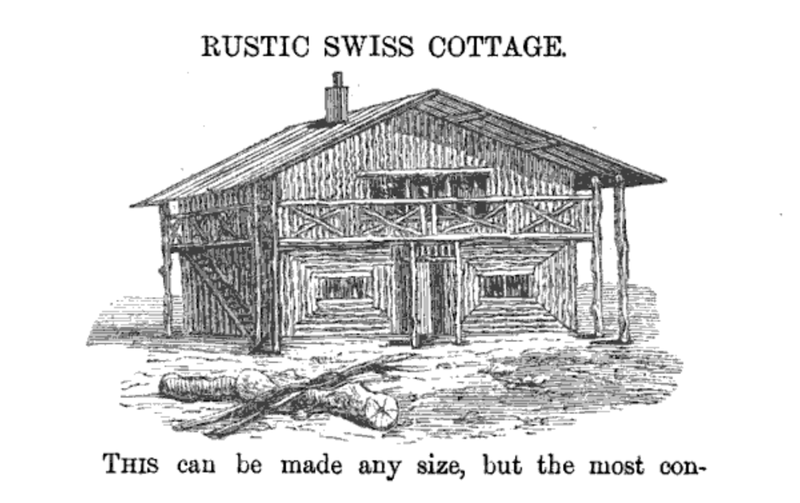 But for Otto Salomon, the reason for the projects being presented in a certain order was to present increasing operational challenges in the use of various tools, that then, when realized, gave the child creative capacity, leading to the ability to design and create objects from one’s own imagination. I received many wonderful good wishes yesterday on my birthday, including a song from the North of Norway, and a Pablo Neruda poem from friends in Stavanger. The song was recorded by phone lit within a forest of city lights, reminding me that even in the dark winter months, there is joy there in the far north, most particularly when shared with friends. The Neruda poem is about the love of things, and most particularly about the things that the hands embrace and make useful. We're not far evolved from dogs in that. I gave Rosie a stick with an old rope wrapped around it, and it became her newest friend. It was pulled at, tossed in the air a bit, carried from one end of the yard to the other and of course chewed mightily. We are like that with new things. We may not chew as much. But we are in love with the world of things. I, in particular, am in love with tools that empower the depths of our humanity, in that they can be used by us in service to each other through the making of useful and beautiful things. 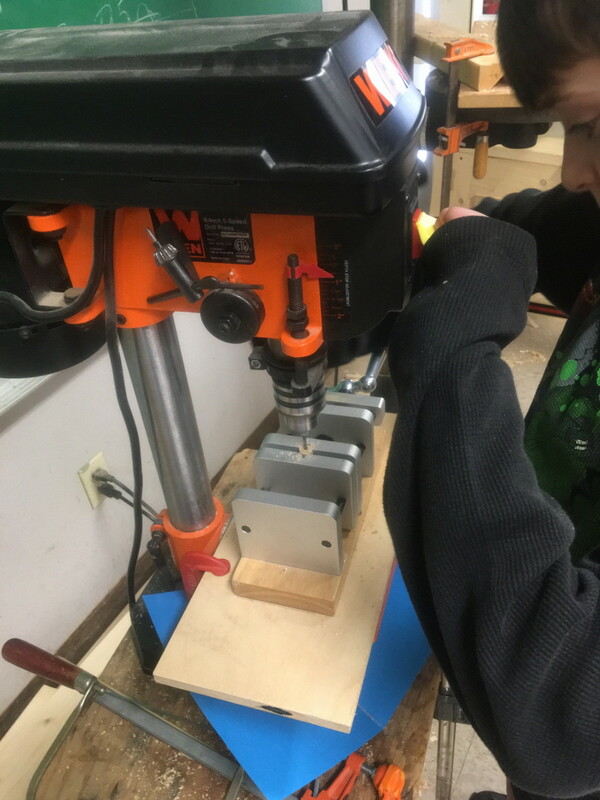 One of the ways to build a curriculum in wood shop is to focus on tools. This was the approach used in the Russian System of industrial arts training. And yet, if, we fail to guide the tools toward meaningful use, we've misplaced the better part of things. A hammer can be idly pounded toward the destruction of stuff, or used to create lasting beautiful things. Those lasting beautiful and useful things can serve in the hands of man far longer than the stick wrapped in rope. Perhaps that's why Otto Salmon made a progression of useful models the core of Educational Sloyd. Putting tools at the center of learning might have missed the more important point. This is my 70th birthday, and that's a bit past retirement age for many Americans. 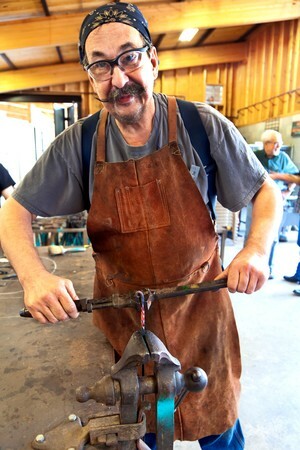 As a craftsman, I've known that I'd not make as much money as some, but quality of life is the main thing. Even as an older man, I feel that I can make significant contributions to my community. I do wonder about whether or not this blog will have lasting impact. Are we not what our hands have made of us? And the challenge becomes this: Do we sit on our hands or put them in action and service to others. If we sit upon them, how do we come to a better realization of our own creative force? 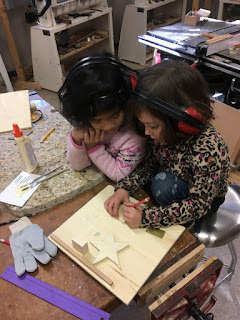 I am engaged in the back and forth with my editor, bringing the details of my Wisdom of the Hands Guide to Woodworking With Kids book into coherent form. A how-to book is different from a book of just words. It consists of images, and details that must all be integrated into coherent pages. It is also different in that it challenges the reader to do more than think and reflect. It calls upon the reader to act. Today I'll play with the dog. If the temperature rises to a level of comfort, I'll apply Danish oil to boxes. There are some things that you can do to help. Test what I've shared with you in your own hands. Arrive at your own conclusions. Are the hands the source of character and intelligence as I've described? If so, share what you learn through your own hands with others. Develop skill. Observe and reflect. If you find some modicum of truth here, share it with others. As one art teacher had observed online, the hands are the philosopher's stone. They give meaning, depth, breadth and longevity to learning and have the power to transform education. But that transformation is a larger goal than a 70 year old man can accomplish on his own. Share what you read here, and take action on what you've learned. I am into the thick of working through the Wisdom of the Hands guide to woodworking with kids with my editors. It is a pleasure to arrive at this point in a project that I've been involved in for almost 20 years. The book should be ready for publication in June. I have so many wonderful photographs to share, that I hope the book will serve as inspiration for others to share woodworking with kids. A good book is most often the work of a good team and this will be my third book with Springhouse Press, and my 13th overall. 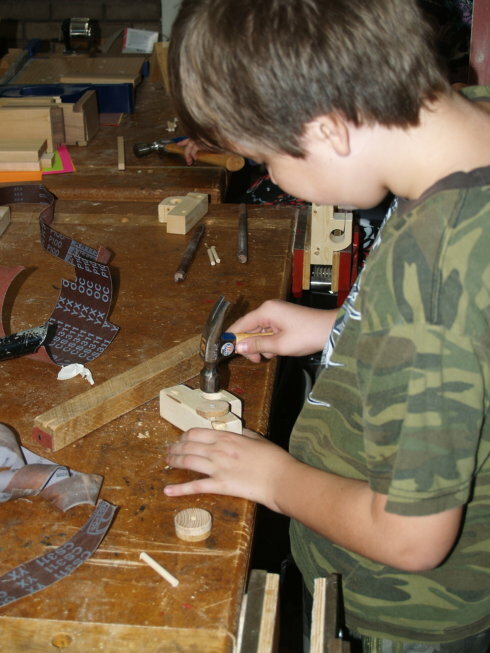 The photo is of Ozric building a toy car, years ago in the Clear Spring School wood shop. This is the day set aside in the USA to express appreciation to those who have served in the military to defend this country. Yesterday we held classes for Veterans at ESSA and were visited there by Senator John Boozman. Senator Boozman has a reputation for assisting servicemen and women who have served in the military. 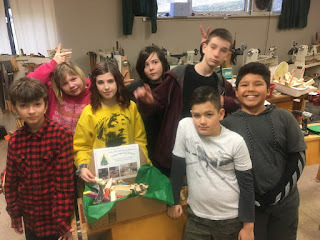 My own class was in box making. 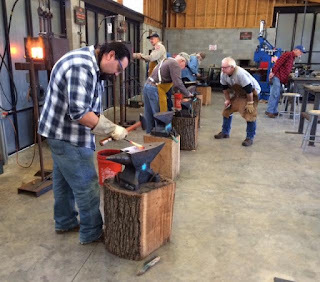 Others were in blacksmithing, painting on glass and jewelry making. Politicians get us into corners that our service men and women must fight their ways out of. Whether a war was necessary or not our veterans stood up to serve and they and their families made sacrifices on our behalf and we have a duty to honor their service, whether a war was justified or not. As a board member and founder of ESSA, I had suggested a Veterans Day event recognizing that veterans, regardless of when they served and in which war, are in need of the healing that comes through the practice of the creative arts. The mission statement at ESSA claims that art is vital to the human spirit. As such, art is one of the ways that we cope with tragedy and loss. It is also one of the ways we push aside the inclination to be combatively engaged. It's the old swords vs. plowshares dilemma. As described in the philosophy of Black Elk in "Black Elk Speaks," the "power to create is the power to destroy" and vise versa. We can devise means through which to blow stuff up and wreak havoc in the lives of others. Or we can build together. On this Veterans Day, I suggest the latter. We must learn from service and sacrifice. Yesterday's event was a whole lot more fun than blowing stuff up. 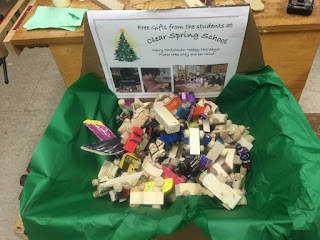 Each of my students made two boxes. Make, fix and create. Give others the chance to learn likewise. My 5th and 6th grade students finished making their arched bridges. Now my decks are cleared in preparation for my class for veterans at ESSA tomorrow. I and my students will be making boxes. The mission statement of ESSA notes that art is vital to the human spirit. It can in many cases ease or heal that which ails us. On Monday we plan to test one of the bridges to see how much weight it will bear. What is it? I'm sorry I don't know. It might be a shrine of some sort, an homage to sharp points. Student woodshop projects come from their minds, not mine. All of my students in grades 1-4 are working on inventions. 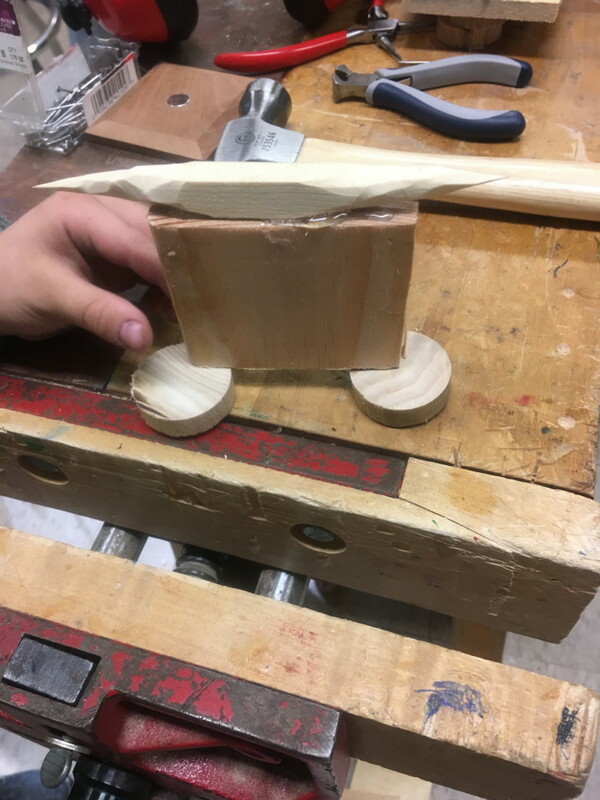 Some need help in wood shop. It is interesting to listen to them describing what they have in mind. But in the meantime, and as I learned many years ago, inventing requires certain skills and knowledge that allows one to build prototypes and test concepts. The work in the photo was treasured by the student, a first grade boy. Make, fix, play and create... Assist others in playing likewise.